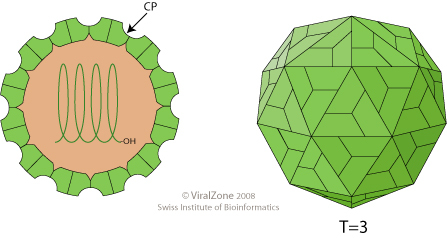 Non-enveloped, spherical virion about 25-30 nm in diameter with T=3 icosahedral symmetry composed of 180 CP proteins. Monopartite, linear, ssRNA(+) genome of 5.3-5.7 kb. Poleroviruses and enamoviruses have a VPg bound at the 5' end. There is no poly(A) tail or tRNA-like structure at the 3' end. The virion RNA is infectious and serves as both the genome and viral messenger RNA. The viral polymerase is expressed by a ribosomal frameshifting at the end of ORF1. Depending on the genus, several proteins can be produced by Leaky scanning. Suppression of termination of the CP stop codon produces CP-RTD (CP extended), the capsid subunit essential for aphid transmission. The viral RNA ORF1 and ORF2 are translated to produce the RdRp fusion protein. Expression of the 3' coterminal sgRNAs. Traduction of these sgRNAs yields the capsid, CP-RTD and movement proteins. TROPISM Phloem tissue within the veins. Polerovirus protein P0 acts as a suppressor of RNA silencing by targeting Argonaute 1 for degradation .